Well, 2012 has been and gone, and I am well into 2013. Having a few days off work has given me some time to sit down and reflect on last year. It has been a year of many changes; on a professional, sports and personal level. Started a professional career as a physiotherapist and a Clinical Pilates instructor. A job which keeps me challenged, which I love and which I am passionate about. I was a physiotherapist for the Old Xaverians Football Club – Seniors and Reserves, which saw them play in the Grand Final with minimal injuries. In the process I learnt more than I could have imagined. Moved clubs from Checkmat to Maromba. A massive decision, heartbreaking in some parts and exciting in others. I love where I am at at the moment and I love that I can keep in touch and train with my old coach Daniel Shaw and his team. My team at Maromba/Absolute MMA has been super supportive, friendly and encouraging. Victorian Titles – 1st competition as a Maromba team member and 1st Vics as a blue belt = 2 gold medals. This set the tone for the year. Competed at my first Abu Dhabi Pro Trials in Sydney. I did well, but lost and came home empty handed. It was an amazing experience. Injured my knee – tore my MCL a month before the World Titles. A big hurdle mentally and physically to get over, but with everyone’s support, I got there. Competed at the GTA with an injury, beat 2 purple belts in the open weight/open belt in the process and lost the final to my team mate Jess. Started an awesome sponsorship relationship with SUB Apparel, who have been amazing in their support of me in 2012. Became an aunty to a very special lil girl Lucy. YAY! Competed at Mundials in LA. By far the best competition experience so far. Got through to the 3rd round, which lit the fire in my belly for 2013. Swam with whale sharks in Mexico with Lachie. AMAZING! Started working with a sports psychologist. Seeing wonderful results so far. Up until June 2012 I have never played guard. From June until December, I played guard at every competition. Started off with a local comp, where I had an anxiety attack just by thinking about pulling guard instead of playing stand up and passing. 6 months later, I can confidently say my guard game is on par with my passing. Took a lot of training, tears and determination. Super proud of all my hard work and courage. I competed at the Victorian and NSW titles, winning 4 titles between the 2 states. Australian Champions Cup (QLD) was my breakthrough competition, where I conquered some confidence demons and won 3 gold medals, including an open weight gi title. I travelled to NZ to compete at the 2013 Abu Dhabi Trials, where I lost. Mentally, I was at my lowest and it took a lot of hard work to snap out of it. I finally won gold at the PanPacific Championships, after a disappointing 1st day. I won the “Most Improved” award from my coach Thiago at the end of the year. Amazing to see the hard work recognized. Throughout 2012 I trained harder then ever before, but most importantly smarter. I added many drilling and specific training sessions in my own time, thanks to Lachie, Stanley, Chetan, Vinnie, Cuong, Nathan, Tom and many others. These guys have been the most amazing team mates one could wish for. By far the most beneficial sessions on the week. Lachie and I sat down after Worlds and made a week-by-week plan on what to drill and train. We did this again in December in the lead up to Mundials 2013. Lots to be learnt and perfected by then, but I trust our plan more than anything! In 2012 I competed 46 times, at 10 tournaments. 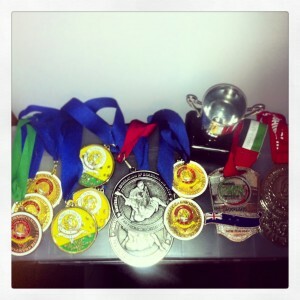 I won 14 medals, 9 of them gold and hold 9 titles. I lost more times than ever before. And I got over it, trained harder and learnt from my mistakes. Most of all, I chilled the F&*#$ out. It’s just a sport. And it’s fun. Started watching Dragon Ball-Z in Portuguese, in order to learn Portuguese for our World/BJJ trip at some stage in 2013. Lots of cartoon knowledge. Less language knowledge. But lotsa fun. 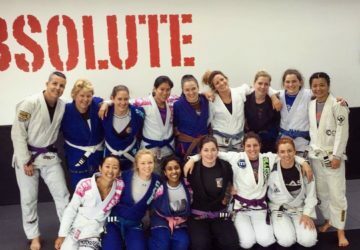 I got to learn from, roll and train with my idol Michelle Nicolini. What an inspiration. Realized that Titles, medals and comp records don’t mean all that much. It’s the process and what you get out of it that defines success. I received support, encouragement, coaching, and a helping hand from more people than I would have dreamt of, including Thiago Stefanutti, Lachie Giles, Gustavo Falciroli, Dave Hart, Dan Shaw, Cam Rowe, Jamie Murray, Ninos, the entire SUB team, all my team mates at Maromba and dad and mum. I am one lucky girl. 2012 was eventful, new, fun, stressful and what I wanted it to be. To top it off, 2013 is already looking even better. BRING IT ON! 2016 was fabulous, but 2017 is looking even better already!